During the Second World War Italian POWs were held in premises on the road to Bathley. 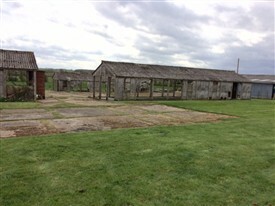 Some of the wooden sheds in which they were housed still survive (2014) and are used for storage. "As you see, only two of the prison blocks are still standing and they are skeletal after all these decades on a windswept hillside. They were built of such flimsy wood, it's astonishing they lasted as long as the Second World War. But you can also still see the concrete bases of the other cell blocks". An Italian POW told me in 1989 that after Capitulation, they were allowed home. He was living 'out' on a farm in Egmanton and was recalled to Nether Headon (3m from Retford) camp. They were then all marched to Caunton Camp, en route to the train at Newark. Here they were offered to stay as 'co-operators', but his cohort decided unanimously to go home. I thought this was 'the' Italian story. I have recently found out that over 100,000 did decide to stay. Thanks for this - the only reference I have found of a camp at Caunton. Just realised that 'my' POW is saying 'Little Carlton' Camp. By the look of it, that is the one you refer to, but was actually on the bend of Bathley Lane, but IN LITTLE CARLTON. Where is the picture taken, please? The picture was taken on Norwell Road, Caunton. The camp at Little Carlton was based on farm buildings, now converted into houses, opposite the village cricket field. I lived at the Camp at Caunton from 1954 to the end of 1962, with my mother and father and later my younger sister. In 1954 I was one year old. Our accommodation was what was presumably the quarters of the guy in charge as that central hut adjoined the cookhouse and dining hall and offered two bedrooms and a bathroom. Apart from these central buildings I believe there were three long huts at each side but the three on the Bathley side had disappeared by the time we moved in. The three on the Caunton side comprised an ablution block, a recreation hall and the hut closest to the Norwell Road was a "posh" hut finished in fine weatherboarding with a good dance floor inside and a small stage. For a time the people of the village had the use of the recreation hall and dancehall/theatre and my father was a sort of part-time caretaker, inasmuch as he kept the grass short. When a dance was to be held I had the honour of scattering the floor liberally with soap flakes. Once a travelling circus went by and we housed several monkeys and a handler for a few days. The Camp also had it's own sewage treatment plant and a couple of car garages and cycle sheds (next to the road) and a parade ground. While it was known as a prisoner-of-war camp, it was actually for Italian prisoners and displaced persons. As anyone could have stepped over the fence and there was no accommodation for guards, fancy gates or towers to be seen it would be fair to assume most of the temporary "residents" were displaced persons. In about 1960 the Camp was sold for £700 to a man named Crannidge (or similar) and he built a fair-sized bungalow on the vacant land on the Bathley side of the compound. In due course the huts were converted to poultry battery houses and eventually we had to move out. It was a great place for a young lad to begin his growing and I made full use of the Beck at the bottom of Jack Pinder's field by falling in as often as possible. Please do get in touch if any more memories of a kid might be interesting. Many thanks for your recollections, Vernon. They're very useful now that I'm researching with a view to producing a series of books about Newark's World War II - at home, on land, at sea and in the air. TREVOR: I am doing a history of the POW system in UK WW2, using any material I can find, based around experiences of POWs who stayed after Notts and S Yorks POW camps. The 'Official' histories (sic - mostly of German camps) do not include at least 5 POW camps or billets near Newark, including Caunton and Little Carlton. Contact me if interesting in sharing.